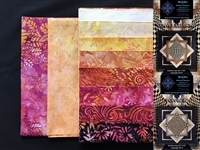 This "limited edition" optical illusion batik quilt kit in gorgeous shades of red, pink, orange, peach and yellow is for either pattern Convex Illusions or Poppin In. The kit includes both patterns and all batik fabric for one entire quilt top and binding. Convex Illusions is a very easy optical illusion quilt pattern using strip piecing and simple construction techniques. The combination of shapes and shades creates the dramatic 3D optical illusion. This is the same quilt as "Poppin' In", with the center created in reverse. This quilt pattern is for the confident beginner. Finished size 60" X 60". Fabric left to right is black background, binding, center, shaded triangles and outer borders. Free shipping on all kits. This "limited edition" batik quilt kit in gorgeous shades of red, pink, orange, and yellow is for the pattern Elegant Star. Elegant Star is an easy quilt design using simple piecing techniques. The stars are made using Tri Recs rulers or templates provided (your choice) and the bowtie block is made with strip piecing and oversize triangles sewn together and then the block cut down to size to ensure perfect points. This technique is also used in the corners of the large stars. This is easier than paper piecing and just as precise. Double sided tape is used instead of pins for the applique – much easier to applique without pins! The kit includes the pattern and all fabric for one entire quilt top and binding. Free shipping! Finished size 44" X 55"